Since she's never been one to turn her nose up at a bit of good old-fashioned pampering, it seemed a natural move for Jennifer Hermon to venture into the world of bath and body products. Promising a veritable haven of bliss for those weary muscles and parched skin, the jennyLou Spa collection arrives just in time to cure the winter blues. We spoke with Hermon about her career and what the future holds for jennyLou Spa. LTK: Thanks for taking the time to chat with us, Jennifer! Please tell us a bit about your background. JH: My pleasure! I decided one day that I wanted to make jewelry, so I did that for about three years. I've always loved body products like lotions and the science within the product ingredients, and always thought it would be great to make them. But I'm not exactly the best cook, even with a recipe - so whipping up butters in my kitchen seemed pretty crazy! LTK: You mentioned you've been a jewelry designer for years. What inspired you to venture into the world of bath and body products? JH: Mostly economics. There is not a need for more jewelry designers but you rarely see a body product line at our local shopping events, so I thought, why not fill that gap? I came across a gal who had a good product, but a different market (tanning salons), so I asked her if she'd be the chef and I the mad scientist. The arrangement is perfect for both of us. I get to do the marketing part, which I love, and even pick my ingredients, scents and colors...but not have the messy kitchen to show for it. Well, it's messy, but nothing to do with recipes and mixers! LTK: You've got products for the body, for the feet, for the tub...even for the guys! Are there any new products on the horizon? JH: Ooh, that's a sneaky way of warming me up to tell my secrets! Well yes...I have a few goodies here that I've been too busy to get passed the "recipe" stage and into the marketing stage. I have a scrub that is so delicious and looks just like the stuff inside a tub of frozen margarita mix. A little something is in the works for those who have told me they'd love some body butter, but they are allergic to most scents. Slather on a decadent body butter. LTK: There are so many companies out there that specialize in pampering body products. What makes jennyLou Spa stand out from the bunch? JH: jennyLou is just a girl who wants to have fun. 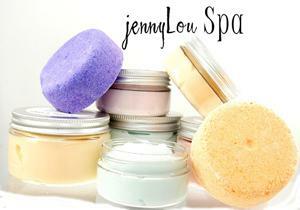 The jennyLou Spa products are definitely made with some of the best stuff out there. 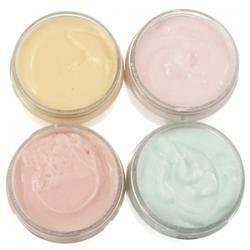 The butters are either mango, shea or a mix of both - not a bunch of fillers. So while I take that part of it seriously, I want the experience to be not-so-serious, hence the goofy names of the bath fizzies: "Leave Me Alone Lavender," "Dip Me in Daiquiri," etc. I don't want to compete with the big-dogs with all of that serious stuff and claim to reduce wrinkles and defy aging! I just want my skin to not be dry and cracked, and for the packaging to make me giggle sometimes. LTK: I think that's something we can all relate to! Your business name is catchy - where did it come from? JH: My grandfather always called me Jenny Lou. I don't know why, because my middle name is Lynn, not Lou. I hated it as a kid, but upon trying to decide a fun business name, it just seemed more endearing and conveyed the easy-going, fun attitude that I wanted for the brand. LTK: Dry, itchy skin is a major concern at this time of year. What's your recommendation for achieving supple skin? JH: There are so many different products out there, and different things work for different people. So try different things and definitely read the label. If your lotion is under $5, then there is a reason - it's probably a lot of water, alcohol, mineral oil and/or petroleum - and that stuff is cheap. You've got to hydrate from within too, though. Lotion doesn't work magic - it's like icing on the cake. Without it, it would just be a dry piece of baked goods. Oh...and exfoliate once in a while!